Batman had his butler Alfred. Luke Skywalker had Yoda. Ariel had Flounder. And when it comes to beating the major villain in your life right now — your inflammatory arthritis — you too have a powerful, super smart partner: your rheumatologist. Working as a partner with your doctor can go a long way in helping you get the right diagnosis, establish the proper treatment plan, find the most effective medications, and maintain a happy, productive life. That said, finding the right rheumatologist for you and your disease can take time. You might not gel with the first or second doctor who treats you. Establishing this type of trusting relationship requires effort on both sides. Once you’ve found a rheumatologist you like and respect, it’s important to know what you can do to help them and, ultimately, yourself. 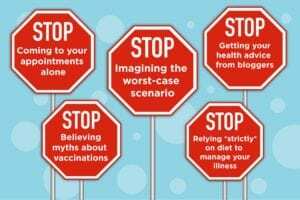 We interviewed rheumatologists to find out exactly what habits they wish their patients would stop doing. Check out this list and see if there are any little changes you can make to improve your health. This may be one of the most obvious ones, so let’s get it out of the way up front. Just in case deadly cancer and heart disease aren’t enough motivation to quit cigarettes, now you can add your autoimmune disease — such as rheumatoid and psoriatic arthritis — to the list of things that smoking makes worse. “Smoking is associated with increased psoriasis, worse joint disease, more joint damage, increased pain, and less function,” says Alexis Ogdie, MD, a rheumatologist and assistant professor of medicine and epidemiology at the Perelman School of Medicine at the University of Pennsylvania in Philadelphia. Talk to your doctor if you need help quitting. We know this is easier said than done. After all, there’s hardly anything more stressful than managing a debilitating, progressive, chronic disease. But worrying about it won’t help you — and can definitely hurt you, Dr. Ogdie says. “Stress makes pain worse and causes you to lose sleep, which in turn leads to more pain and flare-ups, creating vicious cycle,” she explains. It’s not possible to completely turn off the anxious part of your brain, but there are lots of things you can control that will help reduce your overall stress, including mediation, mindfulness exercises, and physical activity, she says. What’s the first thing you did after you got your diagnosis? If you’re like most people, you probably googled it — and then nearly passed out from reading catastrophic stories online. Don’t let yourself go to that dark place. “Negative thinking will make your experience with the disease so much worse,” Dr. Ogdie says. “Resilience is one of the best things you can have to deal with your disease. That comes from being grateful for the things you do have and focusing on the positives.” If you’re having a really tough time dealing with your diagnosis, it’s a great idea to seek therapy — look for a therapist who specializes in patients with chronic illness. Watch this video about the importance of taking care of your mental health. One of the hallmark symptoms of many autoimmune illnesses, including rheumatoid arthritis, is cognitive difficulty, like trouble concentrating and short-term memory problems. This is why it’s crucial that you don’t show up solo, says Orrin Troum, MD, a rheumatologist at Providence Saint John’s Health Center in Santa Monica and on the faculty at the Keck School of Medicine at University of Southern California. “We give patients a lot of information, especially during the first appointments, and it can be overwhelming to them,” he explains. “I always recommend you bring a friend, partner, or caregiver to your appointment with you.” Check out this advice for coping with arthritis brain fog. When people aren’t feeling well, the last thing they want to do is go out and pretend to be happy, not to mention hang out with a bunch of people who have no idea what you’re dealing with, Dr. Ogdie says. However, isolating yourself may only make your symptoms and your pain worse. “Try to spend time with friends and family in a way where you can still interact but be more comfortable,” she says. “For example, maybe today is not a shopping day but you can meet for coffee instead.” Your friends and family are powerful medicine and even though they may not totally get how you feel, they can still be a great help. It’s totally understandable that you may want to deal with stress and pain by indulging in some of your favorite sweet treats — they’re not called “comfort foods” for nothing! But OD’ing on sugar can backfire, Dr. Ogdie says. “It’s not scientifically proven, but many patients report that more sugar in their diet makes their symptoms worse,” she explains. “Even if [sugar] doesn’t cause flare-ups, weight gain and obesity are definitely associated with worse disease symptoms, decreased functional ability, and lower response to therapy.” This doesn’t mean you can never have birthday cake again but that you should do your best to limit it as much as possible, she adds. Check out these tips to cut out sugar and help arthritis symptoms. “Too many people have a preconceived bias against vaccinations and think that getting them will hurt them,” Dr. Troum says. “Not only are vaccines not harmful, they’re essential for people with rheumatoid arthritis as the immunosuppressive medications they take make them even more susceptible to illness.” He recommends getting the flu shot every year, the shingles and pneumonia vaccines, and staying current with all your recommended vaccines and boosters. Read more about the flu vaccine and the shingles vaccine here. While reading other people’s experience with autoimmune illnesses can be helpful, taking health advice from some random person on the internet — and then trying an experimental or unproven treatment based on what you’ve read — is a really bad idea, Dr. Troum says. “I absolutely encourage patients to do all the research they can, just make sure you’re getting your information from reliable, credible sources.” Need somewhere to start? Check out our patient guidelines. Dealing with an autoimmune illness is a lesson in frustration — often it seems like just as soon as you think you’ve got it figured out, your body throws you for a new loop — so it’s understandable that sometimes you get frustrated with your treatment team too. Unfortunately too many patients express that by bad-mouthing doctors to their other doctors, which can make it hard for your team to work together and wastes precious appointment time, says Douglas Roberts, MD, a rheumatologist, assistant clinical professor of medicine at the University of California Davis Medical School, and founder of PainSpot.com. Asking questions and reporting issues is always welcome but save the general venting for a friend, he says. Take a look at any autoimmune website and you’ll likely see lists of recommendations for supplements, essential oils, or other naturopathic treatments. And it’s not that these treatments can’t help; rather the problem is that 1) most don’t have strong scientific data to back them up, and 2) they are not regulated the same way over-the-counter medications or prescription drugs are, so you don’t really know what you’re getting, Dr. Troum says. The key is to ask your doctor before adding anything new, he adds. These supplements for arthritis do have science on their side. “This is more of an annoyance than a serious problem but I’ve noticed a trend with some patients to be chronically late to our appointments,” Dr. Roberts says. This wastes valuable treatment time and inconveniences everyone after you, he points out. It’s true that people with rheumatoid arthritis may have a harder time getting to doctor appointments but that means you should try to plan ahead to account for having to find rides or needing extra travel time due to mobility issues, he says. Being late every once in awhile is human and the staff will do their best to work with you, but being late every time is rude and means you may need to make more room in your schedule to be prompt. Forgot to take your meds? Didn’t follow through with therapy? Slept through an appointment? Have a super embarrassing symptom? Whatever your issue, it’s important to be honest and upfront with your doctor about it, Dr. Blazer says. “I’ve had patients try to hide the truth about their symptoms, their adherence to a treatment plan, details about a diagnosis, or how they’re really doing and while I understand it, it is impossible to really help them if I, as their doctor, don’t get a clear picture,” she says. Bottom line: Always tell the truth. Your doctors definitely know they’re dealing with human beings, not robots, and they want to help you wherever you are, she adds. Nobody wants to get a diagnosis of a chronic illness, especially not rheumatoid arthritis, but your prognosis is likely much better than it was a generation ago, a decade ago, or even a few years ago, says Nathan Wei, MD, a rheumatologist and director of The Arthritis Treatment Center in Frederick, Maryland. Yet he says he’s seen too many patients give up hope and resign themselves to pain and misery. “Today, we have remarkable treatments that are effective in treating arthritis, you do not have to ‘just live with it’,” he says. Talk to your doctor to see if you’re a good candidate for new or emerging treatments.